Talking about ‘making money’ is often thought to be a bit taboo, but it’s what keeps the bills paid and opens up new opportunities for your business to grow. It’s also a measure of progress and success, and inspires a feel good factor. 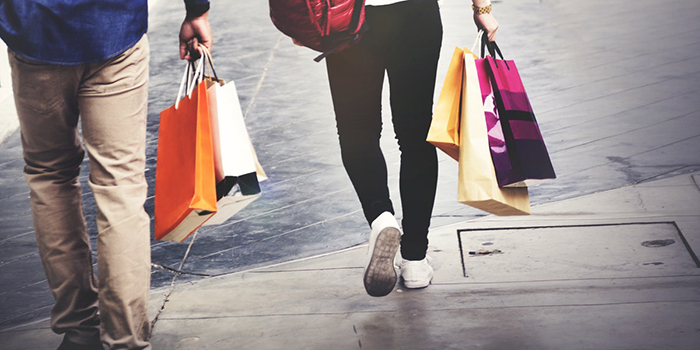 November is the biggest month for sales in the retail calendar. To really capitalise on the increased customer demand, and maximise your opportunity to win those orders from your competitors, we’ve put together this blog post to help you successfully market your store. Two particular days to consider marketing for are Black Friday (23rd November) and Cyber Monday (26th November). Black Friday an extended shopping day after Thanksgiving, and Cyber Monday (recorded as the biggest buying day) have become important days to run offers and drive even more sales. Both these late November sale dates were once uniquely American traditions. Now they’re widely adopted in the UK and across the internet, with customers expecting big discounts and waiting until they have seen what is on offer to buy. As a small business looking to capture some of the sales away from the big players, like Amazon, you need to be clever with your time and resources. In this blog post, we’ve pulled together all of the sales information from Create checkouts (completely anonymised of course) to give you an insight into people’s buying habits over Christmas 2017. Tie all this information together with your own experiences from previous years and you should be able to plan some winning marketing initiatives to cut through the noise of your competitors. Check out the ideas and tips below to make your marketing plans a huge success too! If you haven’t already, definitely set up Google Analytics on your website. It will help you to better understand the customers visiting your website. You can see what days of the week and times of the day are busiest for you, what pages customers visit most and where your traffic is coming from. If you had analytics set up for Christmas last year, spend some time looking at the data you have for that time period. Are your reports similar to our aggregated information in this post, or different? Do you know why? Next, think about what you did last year. Is there anything you would do differently or things you should definitely do again this year? Can you see the impact of those efforts when you look at your statistics or sales reports? Use all of this information to make decisions about what marketing you will do. During the festive period last year, Black Friday was the busiest day for online shopping - with over 50% more sales, on average, than any other day. This was followed up by Cyber Monday, boasting a 25% increase in sales. You can see the Black Friday peak in the graph below. The first week of December was strong on sales too, so this is also a time worth considering when planning your marketing messages. Orders drop off as Christmas gets closer and people take to the high street to guarantee they have what they need in time for the big day. Why not plan promotions around next day delivery during this time to keep sales up? Set up Google Analytics to track historical data. Consider what you did around this time last year and what can be improved upon. Look at other peak sales periods from last year. Black Friday and Cyber Monday are the obvious ones but don’t forget that the start of December was popular too. If you have the time and resources, maintaining a continual, regular, marketing effort to keep in contact with existing customers and draw the attention of new ones is best. If you don’t, pick a few key times when you feel you’ll maximise sales. It might be that you choose to deliver a marketing campaign on Black Friday and send out a couple of emails during the day. 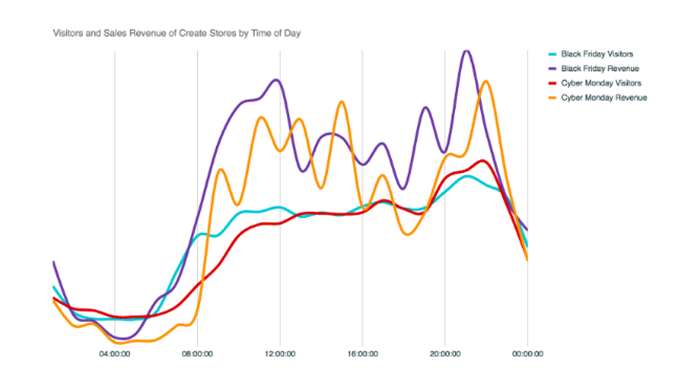 Use last year’s information to predict the peak times for your store. Time these right to get your customer’s attention and it could be very simple and effective to execute. 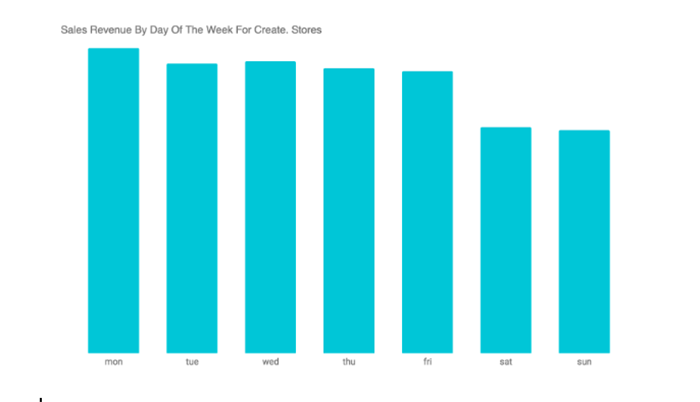 We pulled together sales revenue for Create stores between 30th October and 31st December 2017 and combined it by day of the week. Interestingly, most sales happen on Mondays, is this the same for your business? Perhaps this is customers using their computers at work or purchasing things they weren’t able to get when they went to the shops at the weekend. Another idea to consider is that customers have looked at products in store and then gone online later to check prices and see if it’s available cheaper. Whatever the reason, sending your email newsletter or being more vocal on social media at the start of the week will get your business in front of customers with more plans to buy. If you like to get specific when planning your marketing timings, check out the graph below. This details the revenue by hour for Black Friday and Cyber Monday. You can see that Black Friday sales kick off pretty quickly from around 8am and continue that way until midday. Sales drop off a little after this but really jump up again in the evening with a particularly big peak between 8pm and 9pm. Cyber Monday starts off a little slower, but follows a similar pattern to Black Friday. The sales peaks are very slightly later though, with the big evening sales peak between 9pm and 10pm this time. Perhaps Cyber Monday is following a more natural buying pattern while Black Friday starts very early in the day, and is prompted by retailers sending emails earlier and earlier to get in customer’s inboxes first. 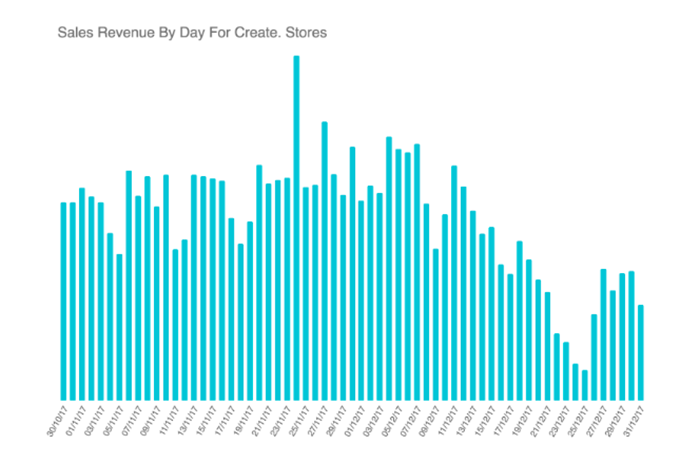 The really interesting thing to note in this data is how website visitors steadily increase as the day goes on, but revenue follows a different pattern, showing that there is a strong intent to purchase at certain points in the day.. If you compare this aggregated information to the hourly visits and sales for your site, you can see whether they are similar and plan your marketing schedule very accurately. There are some peak purchasing times during the day where checkout conversion rates are much, much higher than normal. It’s also worth considering how you might time your sale items throughout the day to capitalise on this buying behaviour. Early emails containing big discounts and high ticket items work well to get customers excited and shopping with you ahead of your competitors. Keep your communications regular throughout November and December. Compare your data and ours to find out when your peak times are. Schedule communications at your peak times. If you’re planning to have a sale or special offer running on Black Friday and/or Cyber Monday, spend some time planning how you will make it exciting and enticing to your customers. Sticking your old inventory on a discount in a sale category might get you some sales but it isn’t going to get your customers queuing up to buy. If you’re emailing your regular customers they’ve probably seen these products before - they might even own them already. Everyone is expecting to get discounts these days, so how can you make it interesting or different? Use excess stock or low-value items to draw customers in. Consider whether these could be heavily discounted and used to create an opportunity to entice customers. Even if you only use these to get people excited and through the door, it could make all the difference in boosting traffic and higher value sales. Mix your heavily discounted items with your bestsellers to get customers adding things to their basket. Use items you’re happy to gift (or are worth the loss) to encourage people to increase their order value. Consider giving away a low-value product if they buy one or more high-value products. Create a sense of scarcity by limiting the number of products you have for sale in the offer and increase the stock numbers as they sell. To make your special offers even more enticing, consider stopping any other sales, discounts or coupons you might be running. Make the customers wait, they’ll be more excited when your promotion starts. You can use psychology as part of your marketing strategy. Consider the human emotions that encourage people to purchase things, such as a fear of missing out, urgency and scarcity. Make the sale different. Use, or order in, specific inventory that will draw in customers and generate excitement. Try sale tactics to increase order value; i.e offer a low-value product for free when a customer purchases a high value one. Use psychology and emotion to encourage your customer to buy. Back in the summer, we took a look at the devices customers were using when visiting Create powered websites. For the first half of 2018, mobile users had increased, while desktop and tablet users had decreased. 46% of people visiting websites had done so using a mobile. If you’re planning some social media marketing, check out your own analytics to see how this changes the types of devices customers are using when visiting your website. We found that 88% of all visitors from Facebook were on mobiles. Ensuring your site is well optimised for those people is key to increasing your sale conversion rates. If you’re not sure how your website works on mobile, visit it on your own phone and see what it looks like. Google also offer a Mobile Friendly tester - simply enter your website domain name and they’ll tell you whether it’s mobile friendly or not. If you’ve built your website with us from 2014 onwards, then it’s very likely to be using a responsive website template. But if the template you have isn’t mobile friendly simply changing to one of our newer templates will make a big difference. Work gradually through your pages to optimise them, starting with the pages which receive the most visitors as these will be where you can have the most impact. Ensure your site is optimised for mobile. Use Google’s Mobile Friendly Tester to check. A landing page is where people first enter your website and it’s a great chance to welcome them with some of your best offers. Landing pages have been proven to improve the chances of turning a website visitor into a paying customer, as they can be very focused. Building a landing page means that you don’t have to spend time making changes to your main pages, such as your About page or your Home page, which you will then have to change back. Instead, you can focus on quickly presenting your special offers on a dedicated page and when you’ve finished, you can simply take it back down again. In addition to this, you can also keep this page hidden on your website. This means that you can send the link to your email list or social subscribers to provide them with exclusive offers. Of course, if you would prefer to prominently feature your offers page on your website for all to see, then there is no harm in this either. The other option is to build multiple home pages which you swap out based on the time of year or an offer you are running. Having a library of landing pages saved and ready to launch, takes the pressure off having to prepare for each new event on the calendar. 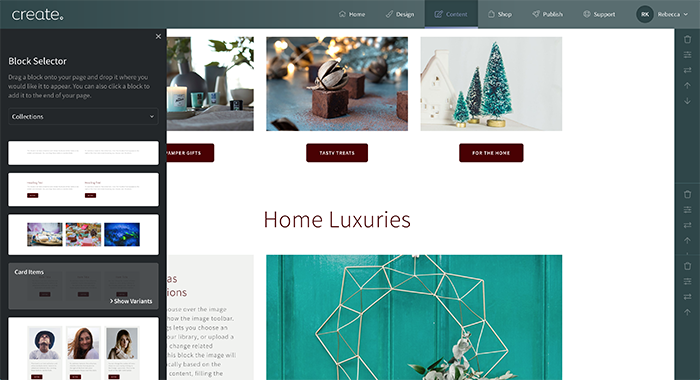 Below are some examples of website pages built with our content making tools to give you some ideas for how you could put them together. You can see these pages in action at https://createwebsite.create.net along with the rest of the website. We’ll be putting together some additional information on how you can build these particular pages. 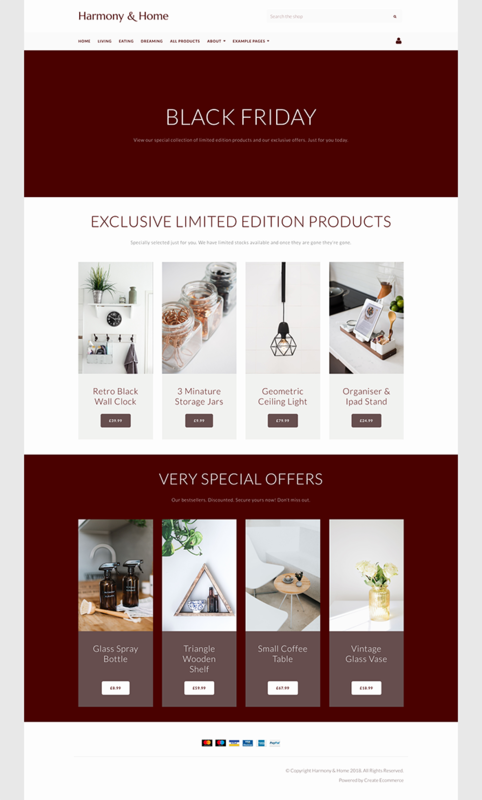 Think about putting your offer front and centre - in the examples below we’ve used the Content Blocks to make sections of new and exclusive products, sale items and specifically themed products picked out to drive people to certain categories. You could include information about the offers you are running more specifically, or more detail about particular products. This can be implemented very quickly if you already have the products to work with. It uses a plain Hero block with simple text at the top to capture people’s attention. The colour contrast used in this block naturally draws attention and moves readers down the page. This is followed by two Collections blocks which showcases chosen products. We’ve used Limited Edition Products and Very Special Offers as the headings here, but you could have exclusive discounts or sale items. A second Featured Items Block (Choose this from Collections in the Add Block drop down). This next example page is more visual and evocative rather than direct selling. We’ve used some stock product photography to create the style but you could create a gallery of festive imagery or happy people to sell your products. This last example page is less focused on specific products and instead showcases areas of interest and product categories. You can use this style to directs customers to areas which are popular or are perhaps more profitable for your business. The sections are all tied together by a common theme - Christmas. The widest card variant has been selected (Choose this from the “Change Layout” setting on the right hand menu). A background image has been uploaded to the Block to create the picture behind the card on the left hand side. (Upload yours in Block settings on right hand menu). Landing pages have been proven to increase conversion rates. Make a ‘library’ of landing pages with Create in advance so you’re ready for different events. Use landing pages as a way to drive customers to a particular area, product or category on your site. Abandoned basket emails can be set up to send a reminder to customers who have nearly completed a checkout but then left without pressing the buy button. Lots of people will be considering where to buy their Christmas gifts, and shopping around, so a timely reminder containing the items they have left in their basket might be just what they need to come back and finish the order. You can fully customise the content of your Abandoned Basket emails, so use this to your advantage. Why not edit the email to compliment your Black Friday marketing offers or include a special message about why they should choose to buy from you. Use the opportunity to increase urgency and remind customers of the limited time offers. Include an additional discount code, free postage offer or free gift code to bring customers back to complete their orders and test what works. Optimise this to improve your conversion rates. Don’t forget to make a note to change the emails back, removing the expired offers when your promotion is over and things return to normal! Make sure you have an Abandoned Basket email set-up. Abandoned Baskets are higher over the festive season so use them to bring people back to complete a purchase. Again, you can create urgency with special offers to drive people back to your website. Offering free postage is pretty much guaranteed to increase your checkout conversion rates, but it can seriously hurt your profit margins if you don’t calculate the opportunity correctly. Consider how much you would need to sell to ensure you still make a reasonable profit on each sale. Once you know this you can decide whether postage offers are for you. For your Christmas marketing why not try out free shipping as an incentive for short periods of time, or offer it over orders of a certain value to increase the amount of products customers buy in one go. Use your order information to work out what customers on average spent with you, either for the Christmas season last year, or in more recent months if you don’t have older data. When you have your average spend, set your free postage just above it - test it and change it to see what works best. Our aggregated data says that the average order through a Create store is £42. If this is similar to yours why not consider giving free postage on orders over £50 or £45 to increase how much a customer will spend with you. Run the offer on special days only to see what works and what doesn’t, but bear in mind the profit margin of absorbing the cost to post yourself. Does a customer buying more products give you more profit than a customer buying less products and paying the postage cost? Email is a great way to present your customers with an offer and invite them to your store. In fact, email has been found to be 40 times more effective than Facebook and Twitter for acquiring new customers. The catch with Black Friday and Cyber Monday emails, however, is that everyone else is sending emails at the same time. The best time to send an email has been determined to be around 10am, but as businesses fight to be the first in their customer’s inbox, they are scheduling email campaigns earlier and earlier. Use what you know when deciding the frequency of your emails. Sending an email once a week keeps you in people's minds and gives you the opportunity to make more sales. During these peak times you might want to send extra emails to tell your customers about new products, or perfect gift ideas. Keep an eye on your unsubscribe rates and don't over do it. Would you click your subject line? Think about what your email contains and the person who you intend to open it. What would make them open your email? 72% of customers open an email due to the discount it offers so you could put an offer right at the start of your subject line. From there, try to create a sense of urgency to encourage them to open your email before your offer is gone forever. Keep your call-to-action clear. If an email has too many links, it can get confusing and lead to less people actually visiting your site. Have one, clear mission in mind and present the button that takes your customers to the next step at the end of your email. Keep your email concise. All the content you want your customers to see is on your website. At this stage, you don’t want to bog them down with too much information, just tell them why they should visit your site. What’s in it for them when they click your link? Use pictures in your email. Visuals have been proven to increase a person’s willingness to read by 80%. By including a striking image in your email, you are improving the chances that they will hear what you are saying and click through to your website. Email is 40x more effective, than Facebook and Twitter combined, for acquiring new customers. Create a campaign to build up to these days and keep customers intrigued. Make your emails visually engaging, concise and have a clear call-to-action to improve your click-through rate. Much like email, you will be competing against hundreds of other companies to be heard on Social Media over the festive season. By creating a buzz around your products in the build-up to Black Friday and Cyber Monday, you are more likely to find success than trying to shout louder than everyone else! The first thing to consider is where your customers are most likely to be. If you are a B2B business, your customers may be on LinkedIn. If you are a crafter, visual platforms such as Instagram and Pinterest could be best for showcasing your products to your audience. Focus on the platform you are most successful on and schedule a series of posts promoting your products and your website. Again, you can tease your audience with the promise of discounts ahead of time, and then share a link to your landing page showcasing your special offers on the day. On Black Friday and Cyber Monday, post regularly throughout the days. Compare your analytics and our data for last year and see where the peaks are during this time. You can schedule posts around these to maximise your exposure. Bear in mind, that the hashtags #BlackFriday, #CyberMonday and #FlashSale will be popular. It might pay to research if there are any tags that are specific to your industry. Better still, if there is a particular hashtag that you know your customers use, you can include this to help you differentiate yourself from your competition and reach your niche, rather than getting caught up in all the noise. Find out where your customers are, and then target that platform the most. Use social analytics to find out when your audience is online. Social media is a noisy place during the festive season - find your niche to stand out. With everything else that is happening during this busy time, you’ve also got to keep up with processing and posting the orders out to your happy customers. To help you achieve this as efficiently as possible, it’s helpful to use the Order Management tools. If you aren’t employing it yet, read our guide on how to use this system effectively. If you do, check you’re maximising the functionality available as it can reduce the manual work you need to do when set up right. If you’re selling in multiple locations you can use it to pull all your orders from eBay, Amazon, the Create Facebook Shop App, and your Create store into one place. You can instantly see what stage of the process each order is at and what you need to do to complete them. You can also automate communications to your customers so that you can update them on each stage of the process. For instance, when their order has been shipped. Read our guide on using the Order Management Tool. Use Order Management to automate the tasks you don’t need to do. Ensure the different platforms you sell on are connected to your Order Management so stock levels are automatically updated. The next few months are sure to be bustling with activity. Getting your preparations in place now will help you to feel more organised over the festive period and solidify your marketing plan. What tactics have you used in previous years for Black Friday and Cyber Monday success? Commenting your suggestions below would be a great help to some of our newer store owners who will be planning their first Christmas sale. If you need help with any of the points mentioned in this blog, your Account Manager would be happy to help you with your preparations.